Friday: PM Update- don’t be deterred by tomorrows forecast for rain. At 1pm today it is still snowing- and we hope that it it stays snow through the evening. For tonight temps are 31-35. The snow will set up, but not bullet proof. Saturday’s forecast is for temps 37-41 in the base area. Tomorrow morning we will skate and classic groom 20-30km- conditions should be great. Clouds are forecast to lift in the afternoon tomorrow– could be a beautiful afternoon/sunset on the trails! We have fielded calls from curious skiers all week because it’s so hard to tell from the valley towns what snow conditions are- here are a couple of your questions with our answers. Are there waterbars on Bryant Trail? It has been warm here this week, but the snow pack is so deep and it’s been getting cold enough at night to refreeze everything. Are all your trails open? Yes! 30km groomed and 70km backcountry. Will you be grooming this weekend? Absolutely. We will have 20-30 km skate and classic groomed. 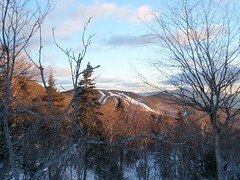 I want to ski Bolton to Trapps Trail- Is that possible? Yes- there is still a huge base of snow in the backcountry. We expect that you should be able to ski all the way to Nebraska Notch Rd. When is your last day? This Sunday, April 6 is our last day. And Sunday will be a beautiful warm spring skiing day. So come and get it while you can!! It started snowing lightly at 9am this morning and temps are right around freezing to 34. There has been a strong wind all morning and the accumulating snow is being blown around. Today we have 30km skate groomed – the surface is loose granular topped with a dusting of powder. This weekend is a great time to gather friends, drop a car on the Moscow Rd and trek the Bolton-Trapps Trail. Wednesday: the Mt. 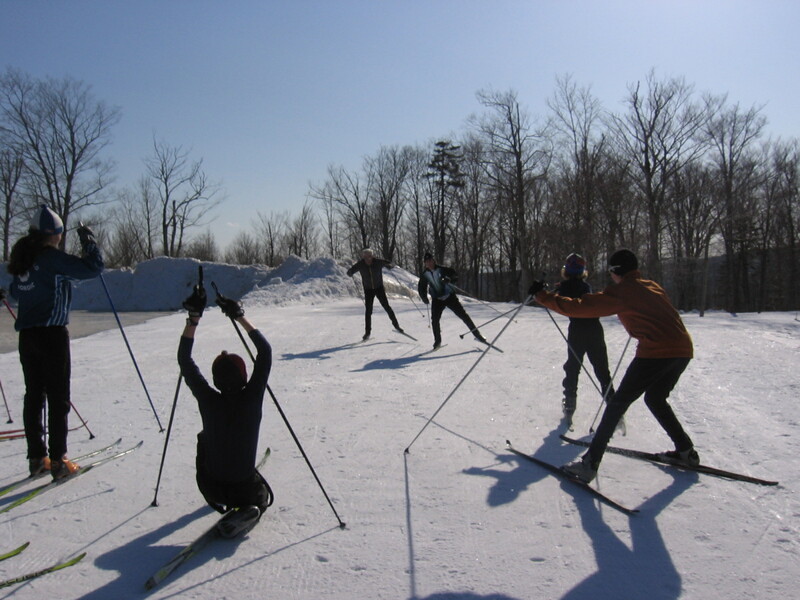 Mansfield Bill Koch/ MMU HS Skiers came up to ski this afternoon. For fun and competition they did sprint relays around the stand of trees at the entrance to Picnic Loop– it was a perfect afternoon sun and soft granular snow. 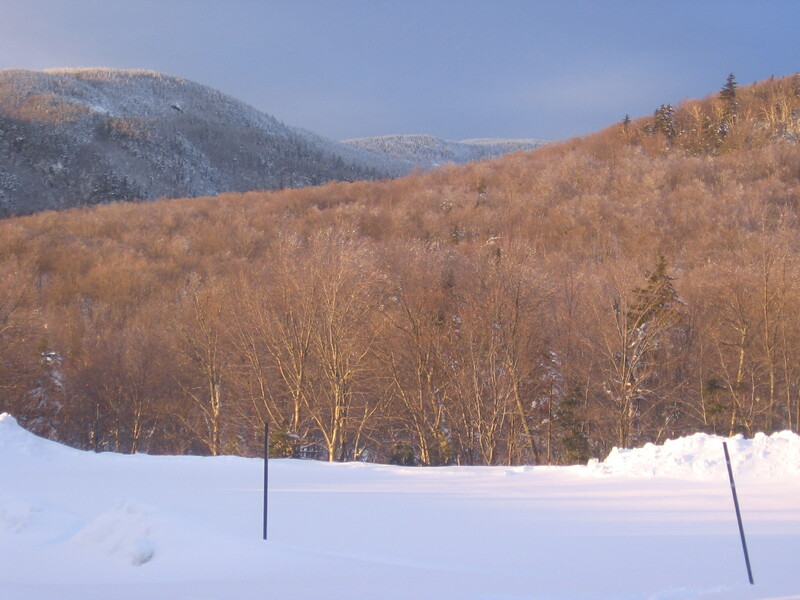 Tomorrow is going to be a great sugaring day– and ski day alike. By mid morning the groomed snow should soften and be great for skating. Teams cheering on the last leg skiers in a fun late afternoon relay. 10am clouds have lifted and it’s a beautiful day. Snow is hard and granular after the warmup we experienced yesterday. We are grooming now and conditions should be great for the next couple days. 20km tilled and groomed for skate. It is 20 degrees and forecast to warm up to 26 this afternoon. Wax is klister– Happy Birthday Gardner Lane. This Saturday is Pond Skimming– Hawaiian Style!! Come up to try your skill, cheer on friends or just watch the spectacle. Starting at 1pm near Vista Quad Bas. Monday: PM- it’s going to be a fun day tomorrow. . . t- shirt skiing. 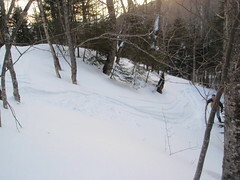 Our trails still have a huge base of snow and the skiing is great. There is a couple inches on top of a groomed surface… we will regroom everything on Wednesday morning. AM-2″ of snow this morning. temps in the low 30’s and some wild weather in the forecast– stay tuned for updates. Call for grooming updates. SuN PM– a day to remember. Sun, warm temps and lots of ski friends. Today was a great ski day. 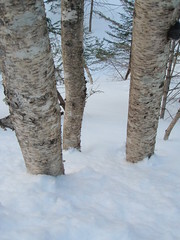 In the backcountry there is still some powder in the shady, protected areas . . . and the snow is definitely starting to transform into that great corn snow of spring skiing. SuN AM- It truly doesn’t get any better than this. At 8am the Sun is out and temp is 10– but don’t be deterred by the temps… it’s going to warm up to 30 by early afternoon. Powder in the backcountry, 30km groomed tracks and 100% of trails open. The weekend is VT Maple Open House Weekend organized by VT Maple Sugar Maker’s Associaiton. This is a great opportunity to meet Sugar Makers, drink some syrup and watch the steam rise. SaT PM update: I went out to ski late in the afternoon today and was greeted by lots of skiers on their way back in from backcountry trails. Everyone was so happy to have another powder day and I heard only good reports about conditions. It will be cold again tonight- lows 10-12… so it should be another powder day tomorrow. The forecast for tomorrow is warming temps through the day with at high a BV of 30 degrees. March has been good to us. We received 4-6″ of new snow Friday and Friday night… and it is a beautiful clear, sunny day. At 9am it is 15 degrees and it’s a little windy (but once you are in the woods the wind will be less). The forecast for today is for warming to 20 degrees. 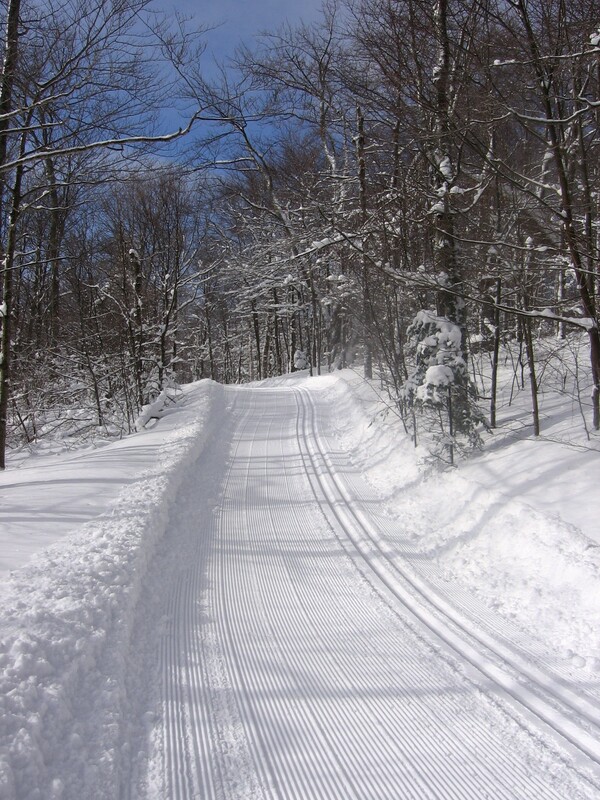 100% of trails are open– 30km skate and classic groomed. It’s perfect skiing– hard to realize that it is almost April. Friday: 4pm update– 4-5″ of new snow today in the base area, a little more on the trails up high and it is still snowing. We will have some good groomed skiing this weekend. AM Report: More new snow this morning and it is still snowing lightly. We have 30km skate and classic groomed with a dusting of new snow on the groomed surface. We will re-groom everything for classic and skate throughout the day today. At 9am it is 30 degrees… and temps are forecast to hold steady through the day. For tonight the temps are 12-16… and Saturday Sunny and temps 15-19. In the backcountry we have had just enough warm temps to transform the snow and cold temps at night to make it pretty firm. Skier reports from Friday are that there is 4″ of new snow in the backcountry– and the skiing is actually pretty good. Wednesday: Afternoon update: It warmed up nicely today. 40 degrees at 5pm and a bright sun/blue sky. We groomed 25km for skate and classic in the early afternoon– and the skiing is very good. 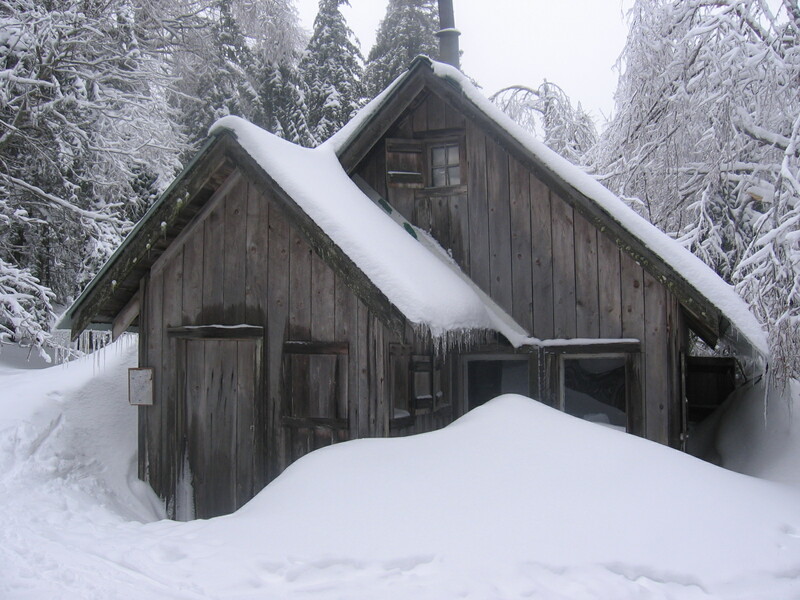 And reports from a couple backcountry skiers that went out were pretty good. It’s not a foot of fresh powder, but there is still lots of snow. At 8am it is 32 degrees and overcast. We did not get the forecast snow last night, but there is some chance of flurries through the day today. We have 30km groomed for classic and skate with mixed snow conditions. The snow has transformed into granular in some places, while it is still packed powder in the colder shady trails. We still have 100% of trails open and skiing is great. Monday: At 8am this morning it’s a warm 20 degrees and promising to be a beautiful sunny day. Great trail conditions, for both Classic and Skating, from this weekend’s snowfall. Snow and a Full Moon. Also Sunday Morning Free Beginner Clinics– Today 10-11am. Three weeks left of this program– Conditions are great, so come on up to Bolton to take advantage of this Free Program!! There are great tracks out there . . .
Today we have 30km groomed for skate and set with a nice classic track. It’s just plain good skiing. At 8am the temp is 12 degrees, but with the sun just now coming over the mtn and a perfectly clear sky it’s sure to warm up quickly. In the backcountry there is a lot of snow! 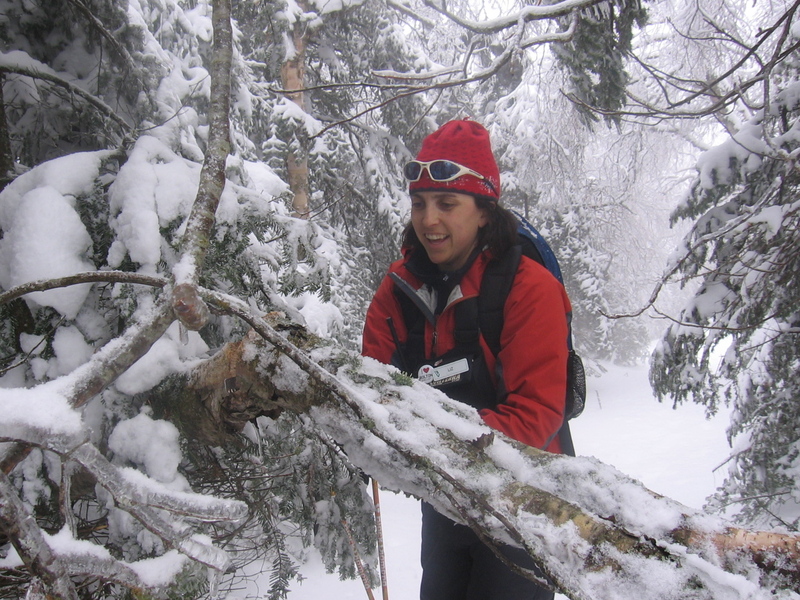 Some trails are windblown and a slaby in places, so be aware of mixed snow conditions. South facing slopes have glazed a bit in the sun the past two days . . . so look for pockets of powder on north facing slopes. You will be rewarded with some great powder turns. All in all good skiing. There are also lots of low branches- b/c of a deep snow pack and some lingering ice from the past couple weeks. 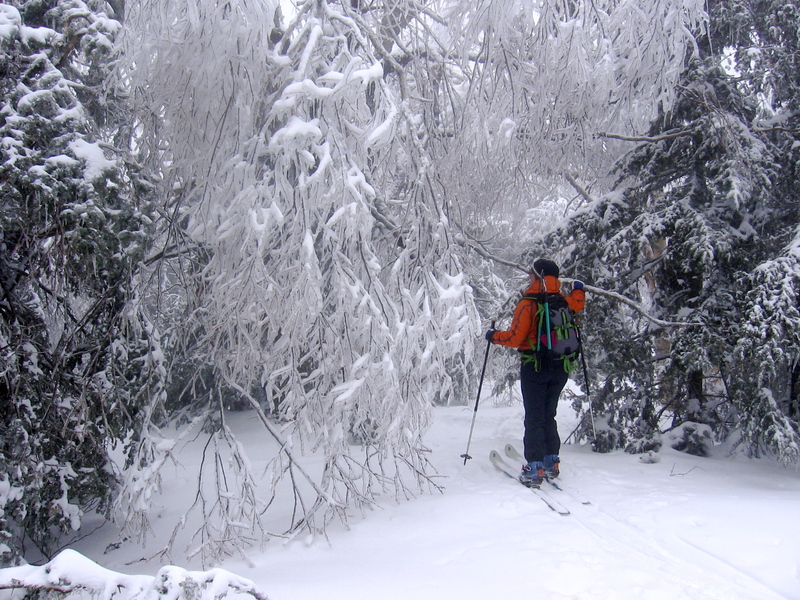 One skier reported yesterday that you “just have to ski like a ninja”– using your hands and arms to block branches from your face. Saturday Report: We are out grooming this morning– it’s going to be some fantastic tracks for classic skiing. with 25km skate and classic tracked. The sun has helped the powder firm up in the tracks. The wax is extra blue. 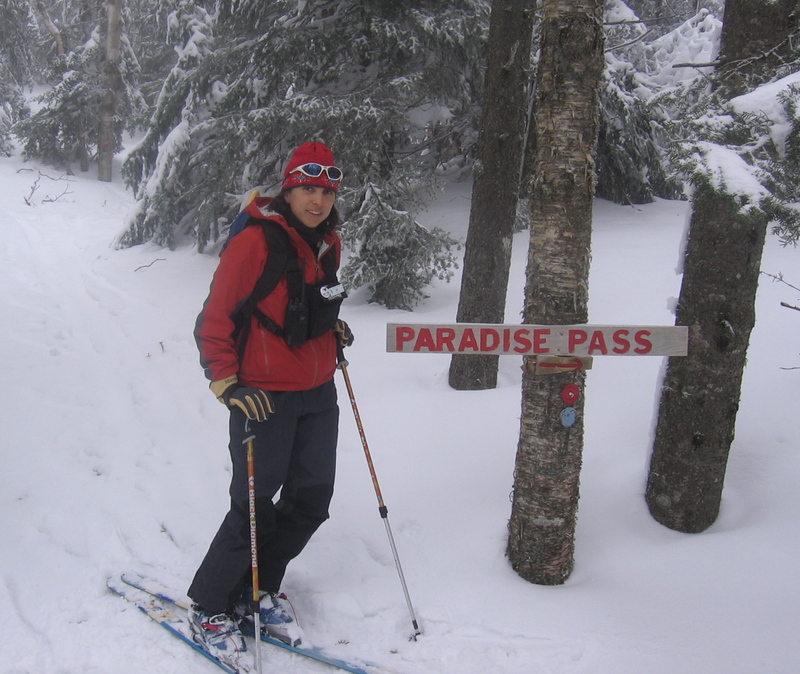 In the backcountry– skiing should be awesome. These photos are from this morning– it’s amazing skiing. Friday Report: The question for this weekend is will you get first tracks in some of this amazing fresh powder. I just noticed that over 100 people have been on the blog today . . and this made me think that everyone is wondering about the spring conditions. It’s more like mid winter conditions with lots of sun. We are at 312″ for the season!!!! That’s over 26′ of snow. And we have had 18-20″ in the last 36 hours. This storm started with some rain on Wednesday night, tuned to wet snow 4am Thursday, snowed all day Thurs and continued ALL night and into Friday morning. Today the clouds magically lifted at about 1:30pm and there was a beautiful blue sky. It has been very windy and lots of Alpine Lifts are on “wind hold” because it’s dangerous to ride. 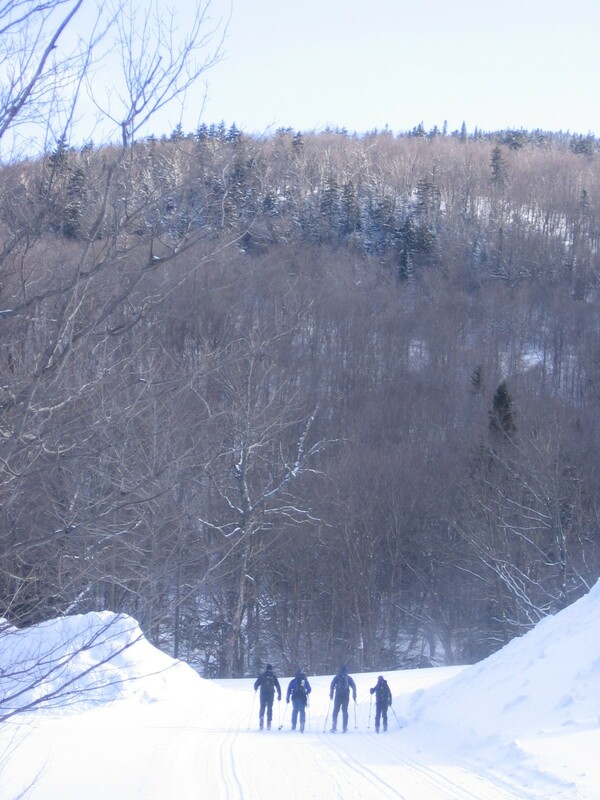 The wind has caused some serious drifting and the report we had from the group from Hanover, NH High School — was there there is a ton of snow in the backcountry. The woods are a little more protected, so the new snow has settled in nicely. Friday Report: It had to happen, fantastic conditions are back! We got over a foot of light powder last night and this morning. Bad news: as of 11 am we have not gotten any grooming done. Due to the ice last week there are a lot of branches hindering our grooming, and the back country. We will be grooming this afternoon or first thing in the morning. 17 degrees at 11 am. Thursday Report: Happy first day of spring– and to celebrate it is another snowy day. It is 28 degrees at 9am/ 32 degrees at 2pm and today we have 1okm groomed. 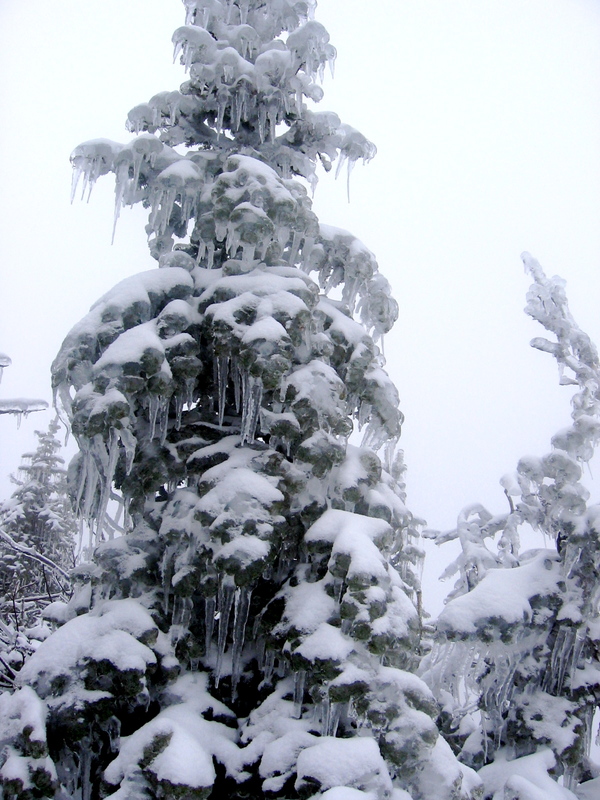 We did have some mixed precipitation and rain yesterday, but we also had about 4″ of new snow! It’s powder skiing to day, the snow is pretty sticky because it’s so warm– and we will groom again tomorrow. We have such a deep base of snow on the trails that the skiing is still great and we are 100% open! 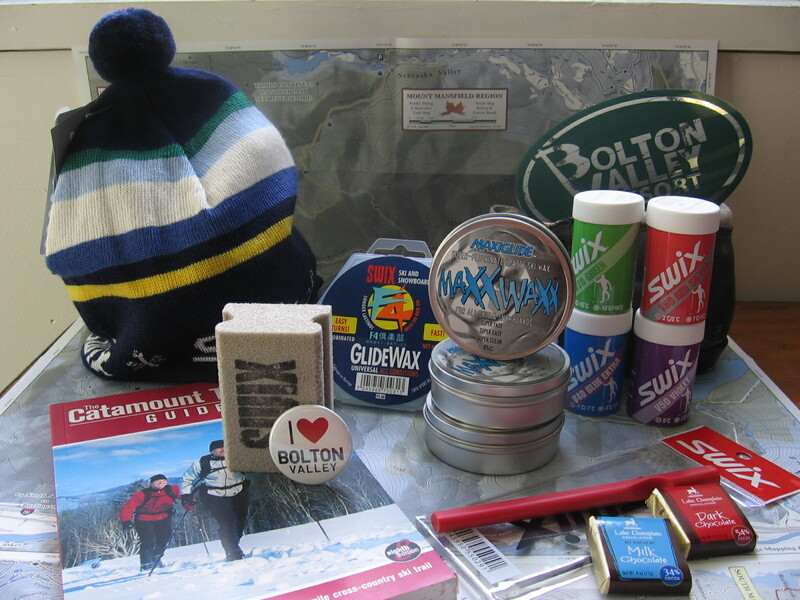 Nordic Ski Shop Specials– 30% off All Hats and Swix Wax/Waxing Tools and 20% off Maps and Guidebooks. Stock up…. and replace some of the waxes you used most this season. And if you have been waiting to buy a Maple Ridge Solutions Backcountry Map– Now is the time. Wednesday Report: 8:30am….. Wednesday is determined to win the worst weather of the week award for winter 08. Wow. We still have a ton of snow– and there is 2-3″ of new snow this morning. It is 25 degrees and quite windy this morning. Check back later in the morning for grooming updates. 1pm update- we will not have new grooming today. there is 2-3″ of new snow on the surface that was groomed yesterday. And in the wood’s it’s peaceful and not too windy. It’s a great day to explore up to Bryant Cabin, Birch Loop and come down Gardner’s Lane. Tuesday Report: A beautiful day today. We have 20 km groomed for skate. It’s good skiing today– powder mixed in with granular. The temp at 11am is 35 and it is forecast to warm up a couple more degrees through the day. Wax is violet/vr 55 now, but as it warms up it may change to red. Sunday Update: More great skiing today. We have 30km groomed and tracked. It did get just below freezing last night and there is a dusting of new snow. Today the forecast for today is flurries through the day and temps around freezing… and for Monday clearing skys and temps in the high 20s. In the backcountry– the skiing is pretty good. 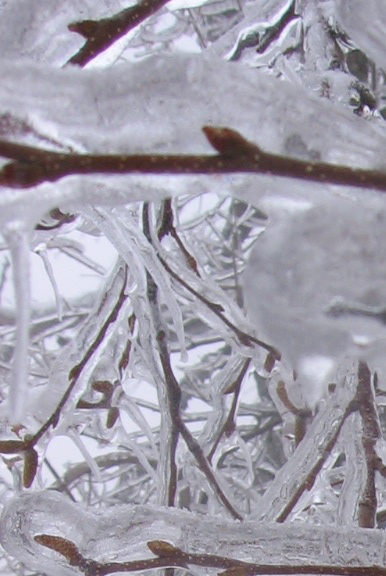 There is still lots of ice on the trees from the storms last weekend. 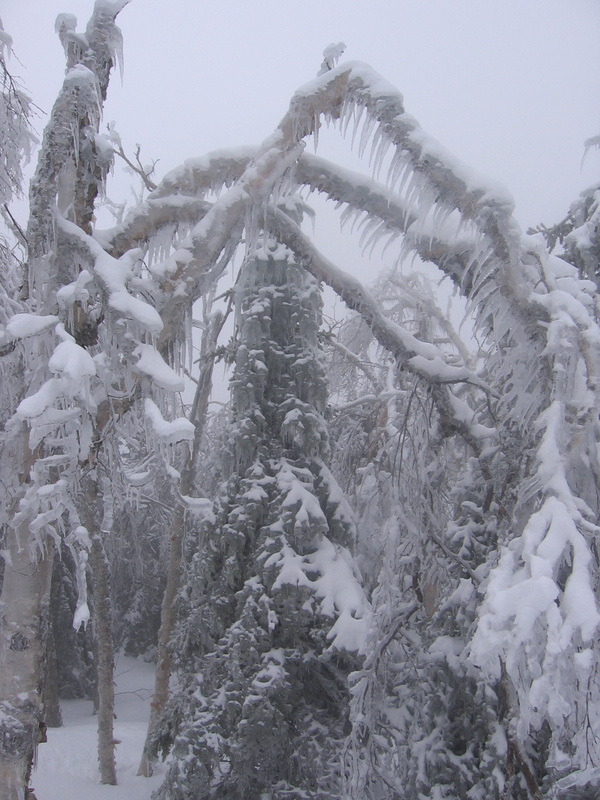 It makes the trees in the high elevation trails like Heavenly Highway, Stowe View look like and Ice Palace. On the trails we have had enough new snow over this past week to cover the crust. Conditions are definitely varied, depending on what trails you are on and the elevation. Some place have a breakable crust, while others are pretty hard. Also keep your eyes out for trees down across the trails– we have cut lots, but there are still more out there. Saturday Update: No rain here! Plus we got a little snow last night. 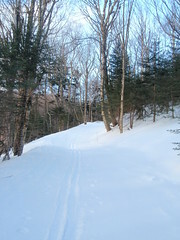 Trails are all groomed and tracks are set. Hope to see you this afternoon! With new snow all week — we have recovered well from the tricky condition last weekend. And don’t be deterred if there is no snow outside your door at home– we have 30′ snowbanks in the parking lot and 40″ of snow on our trails!!! 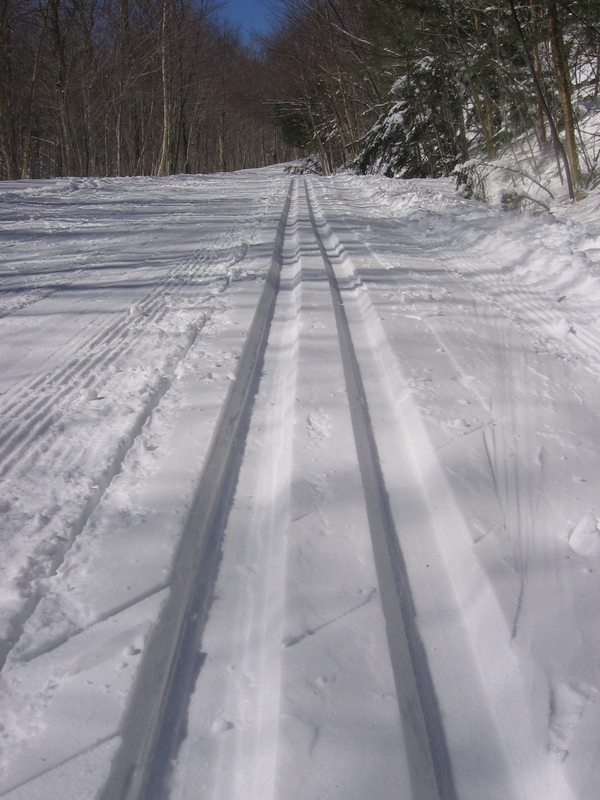 Today we have 30km groomed and 20km tracked– this includes Beaver Pond, Deer Run, Bobcat, Telemark and all the regulars. The big question is what the weekend will hold. The weather forecast looks like potential flurries through Sunday, temps in the mid to high20s and hopefully we will get some sun along the way. It’s going to be great skiing.